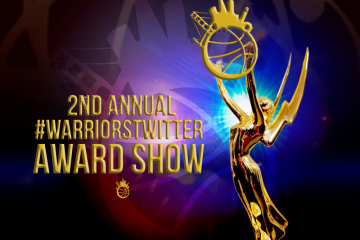 We are over 3,400 words into our keys for the season and Golden State Warriors players have yet to be discussed. Well, it is a players’ league, and we all know that an owner, GM, and coach are only as good as the players on the floor. As we approach the 2010-2011 season, the essential questions for the players are, 1) does this season’s Golden State Warriors roster have enough talent and chemistry to have a winning season, and 2) can this team compete for a playoff spot? I believe that Stephen Curry and Monta Ellis are primed to emerge as the best backcourt tandem in the league, and if not the best certainly the most exciting. These are not the musings of a homer. Circumstances are ripe. If Stephen Curry can maintain the level of play he demonstrated the second half of last season, he will be a strong candidate to make the All Star team. Curry steadily progressed through his rookie season. He ended the season averaging 17.5 ppg, 5.9 apg, and 4.5 rpg. The second half of the season, from February through April, Curry averaged 21.9 ppg, 7.5 apg, and 5.15 rpg. In his last month of the season over eight games, Curry averaged a Lebron-like 26.4 ppg, 8.1 apg and 6.4 rpg. As Curry adapted to the NBA game, his productivity kept shooting up. There is no reason to suggest that Curry can’t maintain or even improve on his second half averages of 21.9, 7.5, and 5.15. The experience he gained this summer for Team USA can only help him in his development and maturity. He has promised that he will work on his defense. That is certainly an area that he can improve, though he wasn’t bad the second half of the season. Team USA coach Mike Krzyzewski commented this summer that what impressed him most about Curry was his defensive play. If Curry markedly improves on his on ball defense this season, the results will show in the win column. In addition to defense, Curry must work on taking care of the ball. He was 12th in the league in turnovers. Curry is a very creative player, and that creativity should be encouraged, but he has to limit the number of careless and lackadaisical passes he makes in games. Curry will be a year wiser and more mature this season, and he will have a much better cast around him. He and his backcourt mate Ellis are now on the same page, and they have established a friendly bond both on and off the court. Their chemistry will be a great subplot of the 2010-2011 season. And Curry now has bigs that he can get the ball to. The sure handed Biedrins is back and healthy, and the addition of Lee who poses a threat as a low and high post scorer should take pressure off of both Curry and Ellis. The epiphany that Ellis experienced last summer should make a world of difference for his own performance and that of the entire team. Ellis has always been a unique and special talent. Last year he amassed impressive stats of 25.5 ppg, 5.3 apg, 4.0 rpg, and 2.2 spg, career highs in all areas except rebounding. Great numbers, yes. The problem was Ellis’s impact on the game didn’t measure up to his statistical performance. He became less efficient and he was labeled a volume shooter. His play did not translate into wins. In fact, the team won as much with him off the court as they did with him on it. But Ellis went through an epiphany this summer. He has embraced his teammate Curry and has accepted the role of two guard. This summer he worked with assistant coach Stephen Silas to study his game and make an effort to return to the efficient player that he was two seasons ago. Something tells me that this will be Ellis’s best year as a pro. He is not likely to eclipse or even match last years statistics, but his impact on the game should improve as he finds synergy with Curry. Like Curry, Ellis needs to work on taking care of the ball. He was the league leader in turnovers last season with 3.8 per game. Playing off the ball, those numbers should go down this season. Ellis will also need to give a much more consistent effort on defense. He has shown in the past that he can be a lock-down defender when he is motivated and focused. But he has failed to do it on a night-in, night-out basis. Finally, Ellis must not give in to impulse. This offseason he has been able to clearly articulate what the team needs from him. Once he is in the heat of battle, he will need to be mindful of his role and not allow his ego and impulses to get the best of him. Curry could use a little Zen in his life to moderate his passions and instincts. Calling Phil Jackson! Though they are a smallish pair, last season Ellis and Curry were the third best rebounding guard tandem in the league. Their quick hands and feet made them number one in thefts. Ellis was second in the league in steals and Curry was third. If both players fulfill their promise to become better on ball defenders, that could make the difference in the team making the playoffs or not. Regardless of how much they improve on defense, their offense will be explosive and teams will have a very difficult time containing this dynamic duo. The chemistry shared by Ellis and Curry has the potential to be magical, and I think this will be the year that the NBA takes notice. The Warriors have been weak up front for so many seasons it’s hard to know what to make of this year’s front line. 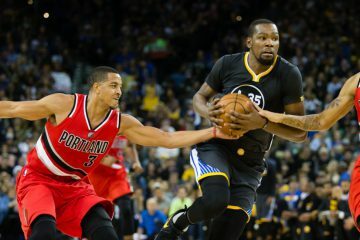 Losing the athleticism of Anthony Randolph and the energy and shot blocking of Ronny Turiaf left the Warriors even weaker up front on defense. Yet the arrival of All Star David Lee brings the team much needed consistency in the rebounding and inside scoring departments. In addition to post play and rebounding, Lee brings leadership and a high basketball IQ to the front court. Over the last few seasons he has been the Knicks most popular player. The Warriors are getting Lee at the right time in his career. At 27 years old, he’s still young, but he comes to the team an experienced and accomplished veteran. (Sadly for Don Nelson, Lee is the veteran post guy that he always wanted.) Lee has said recently that he’s never played with a unit that has chemistry as good as this year’s Warriors. If that is true, there is no doubt that the fifth year veteran is a big part of this unit’s newfound cohesion. What Lee does not bring to the team is defensive prowess. For all of Lee’s great attributes, he seems to literally shrink on the defensive side of the ball. Fans on the west coast have not seen a lot of Lee. When you watch Lee beyond the highlights it is surprising to see what a mitigating figure he is on the other side of the ball. One wonders how one of the league’s best rebounders and better finishers can be such a timid defender. He has promised to work on this aspect of his game, and every year he has met the goals that he’s set for himself. Last season it was developing a consistent outside shot. He did. But improving defense is not about learning a new skill. It’s about taking on a new mindset and getting tougher. I’m skeptical that Lee has it in him to become a good defender. It’s too bad, because if he could develop that part of his game he would permanently elevate his status in the NBA. It’s up to Lee to prove the skeptics wrong. If doesn’t…Well, that’s why the team drafted Ekpe Udoh and signed Louis Amundson. Before the preseason started, Dorell Wright was regarded as a wildcard. Traditionally the Warriors have always had good small forwards. With the trades of Corey Maggette, Stephen Jackson, and Kelenna Azubuike the Warriors found themselves this summer thin at the 3 spot for the first time in years. Wright has played well in camp and in his preseason games. 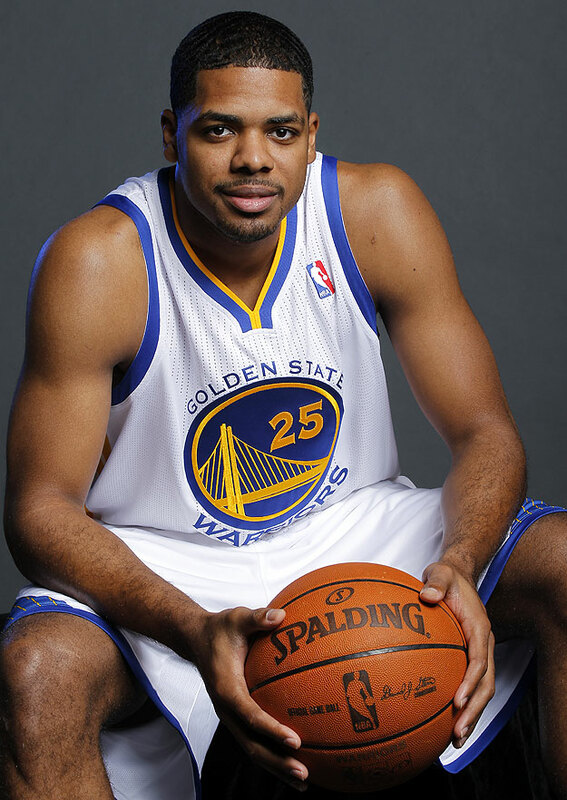 The Warriors feel good about their new starting small forward. So far this preseason Wright has demonstrated that he has both the skills and athleticism to succeed in the Warriors up tempo system. He dribbles, passes, shoots, finishes well, and provides strong perimeter defense. Wright has been a big part of the good chemistry that the starting unit has shown early in the preseason. Though he has not played a starring role in preseason games, he has shown that he can contribute and fit in well with the starting unit. However, Wright is still an unproven player. Warriors fans have to hope that Wright will be content with a complimentary role and not try and do too much, a la Stephen Jackson. As it is, he is proving to be a nice play maker who also can provide much needed perimeter defense. With less than two weeks to go before the regular season, Wright remains one of the Warriors x-factors. If he pulls together his best season and emerges as an impact player, the Warriors will elevate in the win column; if he fails to live up to expectations, the Warriors could struggle. All Andris Biedrins has to do to make most fans happy is return to his form of two seasons ago. If he can go back to averaging double figures in rebounding and scoring, he will be a big help to his team. When healthy and active, Biedrins is a strong asset. People forget how efficient he is around the basket. He has a career field goal percentage of .603 (notably higher than his free throw percentage). Before last season, he had been among the league leaders in rebounding and field goal percentage. The big question for Biedrins is will he bounce back? Last season was the first time since he was drafted that the affable Latvian showed a dour side. Who could blame him? Burdened by injuries, Biedrins was a shell of himself. So much negative attention was been given to his free throw struggles last season. Well, that’s always been an issue for him. And keep in mind that last year’s infamous 16% at the line was based on a mere 25 free throw attempts. That’s not a significant sample size. I’m not minimizing the problem as much as I am putting it in the proper context. Biedrins is a career .516 free throw shooter. He’ll never be a great at the line, but neither are a lot of centers who have enjoyed successful, productive NBA careers. Fans have to accept Biedrins for what he is, a rebounding center who scores on opportunity baskets and defends the paint well. And though he will have nights against bigger or more athletic centers like Dwight Howard where he is the lesser the player, he is still one of the better centers in the league when healthy. The Warriors will need a full productive season out of him if they are to make a push for the playoffs. As crazy as this sounds, Biedrins is one of the team’s most indispensable players. When he is in the game the post is anchored. Without him, the team is undersized and outmatched up front. 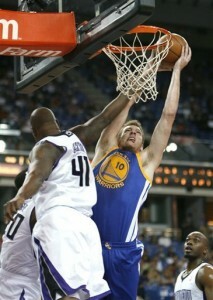 If Biedrins is fully recovered, this should be a bounce back season for him. (Something tells me he’s not a full strength yet, but will be by early in the regular season.) For the first time since he entered the league, Biedrins will have a legitimate power forward playing next to him each night in David Lee. Lee will also benefit from this partnership. Neither player will have to shoulder the rebounding load all by themselves this season as they have had to in the past. Together they will provide an inside fortress that the Warriors haven’t had for years. Biedrins and Lee have reportedly developed a good chemistry. Both enjoy passing the ball and running the floor. Though not nearly as dynamic as Curry and Ellis, the Lee and Biedrins partnership should be productive and effective. As I wrote at the top of this section, I think that the front line is hard to nail down. But looking at Lee, Wright, and Biedrins as a whole one thing stands out: this front line can rebound, pass, and score better than any Warriors front line we’ve seen in a very long time. 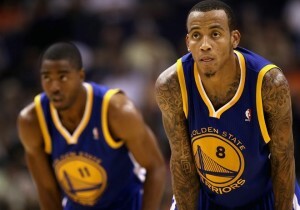 And like Monta Ellis and Stephen Curry, they should have strong chemistry. The entire starting unit should be very strong this season. And though there is plenty of individual talent there, this is likely to be a unit whose sum is greater than its individual parts. Early indications are that the chemistry and cohesion will be great with this group. In their preseason games, the ball movement has been terrific among the starters. The group is athletic and smart. They make quick decisions with the ball, and they seem to enjoying playing together. If the starting unit can maintain good health this season, I think that the playoffs are a good possibility. There are four quality players who will earn their way into the rotation this season, and each will contribute in different ways. These key reserves are Reggie Williams, Brandan Wright, Louis Amundson, and Vladimir Radmanovic. Reggie Williams was a great story last season. Rare is the player who comes in to the NBA from the Developmental League and is signed to a TWO year contract. Well, we learned last season that that is how Reggie rolls. Like a Lou Rawls ballad, the kid is smooth. Though Williams showed he had a fairly diverse skill set last season (15.2 ppg, 2.8 apg, and 4.6 rpg in 32 minutes per contest), this season he will likely be a designated scorer off the bench filling in at the 2 or 3 spots. Last year’s injury depleted squad needed more from Williams. This season he is not likely to get 32 minutes of floor time, and his role will be specialized to his strengths and instincts, which are scoring. Williams is a pure scorer, and he does it in a variety of ways. He can shoot from downtown, he can shoot the midrange stuff and runners, and he can get to the basket. He’s not super athletic, but he’s got rare offensive skills. He’s that guy you see on the playground who holds court all afternoon and just keeps knocking them down. When the Warriors are in need of a basket, Williams will be the first one called off the bench. Though Williams has struggled this preseason—mostly playing with the second unit—he should have a very productive season and serve as an effective sixth man. The Warriors are counting on his consistent offensive production off the bench. There is no player on the team that needs to have a strong year more than Brandan Wright. After three very disappointing seasons, this blue chip prospect out of North Carolina must flourish under a new coach and system. Certainly Wright has the physical gifts to make be special. The question is does he have the durability, the fire, and the desire? If blogs and message boards are any indication, most fans have lost faith in Wright. Through three preseason games, it appears that Smart has also lost faith. Wright has seen very little action, and Radmanovic has taken most of his minutes as the reserve four. Wright is the Alex Smith of the Warriors in that this is his make-it or break-it year. I bet two buddies of mine a couple cases of beer that Smith would not have a good year. From the looks of things, my refrigerator is going to be stocked with plenty of beer for quite awhile when the NFL season ends in January. Now if I had to make the same bet replacing Smith with Wright, I’d probably go the other way. In spite of his history and the developments early this season, I still think that Wright is going to have a good season. Unlike Smith, Wright has been held back by a single injury. Before the injury occurred, many argued that he was held back by his coach. Regardless, Wright is healthy now, and he is just getting back into basketball shape. Wright will never be a great rebounder. He’s just too slight and soft to be a consistent force under the glass. He is your classic finesse big. He is freakishly long, he has quick hops, and he can run the floor. He is a tremendous shot blocker for a forward, and he has a nice low post game. Before injuring his shoulder two seasons ago, Wright was showing signs of becoming a force. His shoulder injury cut that short. With everything on the line for Wright this season, he should have plenty of motivation. Wright is another big x-factor for the Warriors this season. If he finally stays healthy and plays up to his potential, the Warriors will have much needed quality veteran depth at the power forward spot, something they haven’t had for years. In 20 minutes per contest, Louis Amundson averaged 5.5 ppg and 5. 5 rpg last season. Hardly earth shattering numbers. But with Lou it’s never about the numbers. Amundson brings to the Warriors much needed scrappiness, hustle, and banging. Though he’s not a great scorer, he is a pretty good athlete. Hopefully he’ll bring in a little bit of nasty too. The Warriors are a team searching for a defensive post presence, and that is why they vied for Amundson’s services. 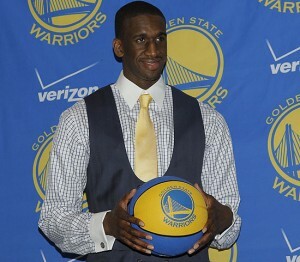 Amunndson has said recently that no team pursued him as aggressively as the Warriors. That’s not a surprise when you look at the Warriors needs and you look at what Amundson brings to the table. 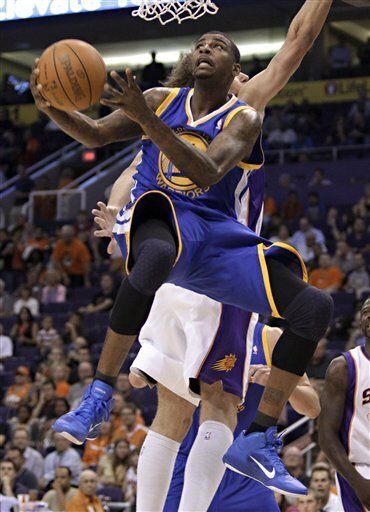 Amundson will likely spend most of his minutes backing up Biedrins, though at 6’9” he will be an undersized center. He will also play behind Lee and B. Wright. If he can give to the Warriors what he gave to the Suns last season, the Warriors will be very happy. Vladimir Radmanovic has emerged this preseason as a solid rotation player. It appears that the health issues that bothered him last season have gone and he is ready to be a steady contributor. Radmanovic brings good size, ball handling, and perimeter shooting to the front line. As I have already indicated, he is much better suited for the small forward position than the power forward spot. He helps spread the floor with his outside shooting, though he has been streaky his entire career. He is a good rebounder for a 3, but he is a weak defender. This is a contract year for Radmanovic, so he should be very motivated. The Warriors should capitalize on that as long as they have him on the team. He may be traded before the trading deadline to a team looking for a big expiring contract. But as long as he is here, he will likely be a key reserve. Ekpe Udoh, Rodney Carney, and Charlie Bell, are three question marks going into the season. None of these reserves are expected to be impact players, but each brings a little something that the team needs. First round draft pick Ekpe Udoh is the biggest question mark of all at this point as he has not played a minute of basketball against NBA players thanks to an injured wrist that has sidelined him all summer and will keep him on the bench through the rest of the year. Though a high lottery pick (sixth overall), no one is expecting great things from this 6’10” 240 pound rookie out of Baylor. Many draft experts say that drafting Udoh at number six was a reach, and the Warriors received low grades from most draft pundits. 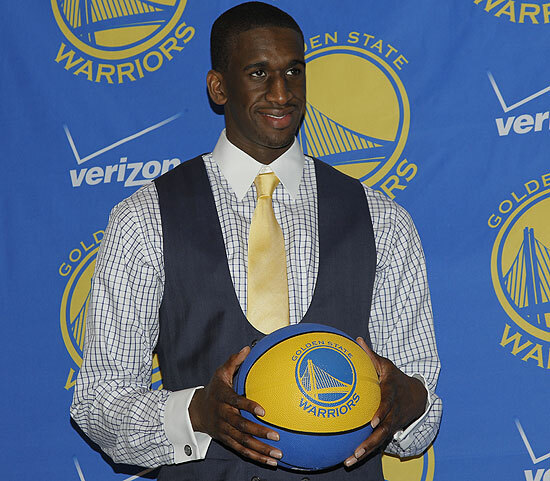 If Udoh doesn’t pan out, fans will lament for years that the Warriors got the 6th pick in a five man draft. With Demarcus Cousins playing just up the road, they are likely to anyway. Many fans have begrudged the late season push to get Don Nelson his all time victory record as it secured for the Warriors fewer ping pong balls and shot at the talented Cousins. 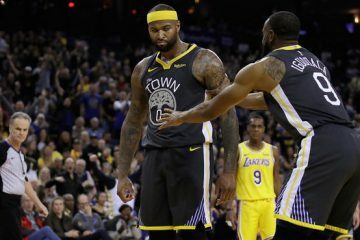 It will be up to Udoh to make Warriors fans forget about Cousins. Good luck with that, Ekpe. Of course, it’s not Udoh’s fault that he was drafted sixth. If he can come in and block shots and rebound as advertised, fans will probably be fairly happy. Any offense that Udoh provides will be gravy. The good news for Udoh is he doesn’t have the weight of high expectations to bear. Given the defensive weaknesses of our front line, Udoh will actually be a nice ace in the hole if he can contribute the second half of the season. 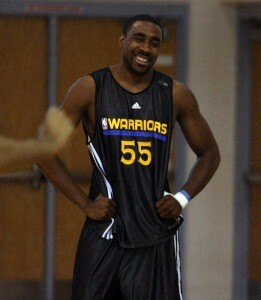 Warriors fans should love Charlie Bell for one simple reasons: he’s not Correy Maggette. Bell along with Dan Gadzuric was traded for Maggette late last spring, thus freeing the Warriors of an onerous contract that many thought would be impossible to shed. That alone is reason to welcome Bell. But there is also reason for Warriors fans to not like Bell: he is not the backup point guard that the Warriors need. Bell is a good perimeter defender, but he is the classic tweener guard, too small to play the 2 and not skilled enough to play the 1. He had a spectacular early career over in Europe, but has had a very average career in the NBA thus far. For the minutes he’s logged over in Milwaukee the past two seasons, he has not been especially productive. Unfortunately, the Warriors will not find in Bell the quality back up point guard that they need. 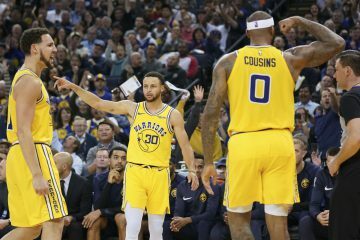 As Keith Smart works to regulate the minutes of Monta Ellis and Stephen Curry, he may have to each one play the point when the other is off the court, even though he has said that he doesn’t want to play Monta Ellis as the backup point. I just don’t see how he has a choice. Charlie Bell could then be the third point guard in the rotation. Rodney Carney is an athletic wing who can play a little defense and provide energy off the bench. The fourth year veteran has not had a distinguished NBA career, but he is looking for new life with the Warriors. The fast pace of the game here may compliment his athleticism and skills. Though Carney is not a very good shooter, he is explosive around the basket and he runs the floor well. He could be a very nice reserve who provides energy and a well needed spark. Speaking of sparks, Jeremy Lin may be the most interesting human interest story on the team. Certainly when he enters the game the cheering he receives warms up the building. We all know the Jeremy Lin story by now. Palo Alto Kid of Taiwanese descent, who leads his team to the state championship, then goes to Harvard and leads them to their first Ivy League Championship in decades, and then makes it to the NBA on the merits of a single great game in the NBA summer league against the number one draft pick John Wall. The kid is a living, breathing Cinderella, and I for one am hoping the clock doesn’t hit midnight this season. It’s hard to say if Jeremy Lin will make it as a rotation player in the NBA. From the informal reports that I have read, Jeremy Lin has a hard time keeping up against NBA guards. He isn’t consistent with his outside shot and he can’t go to his left. These are two big limitations. But Jeremy Lin has proved the naysayers wrong time and time again. He has earned accolades from his coaches and other coaches, such as UConn’s Jim Calhoun. I was in Vegas when Jeremy Lin matched up head-to-head with John Wall. First of all, Jeremy Lin did not win the battle. Wall had the better game if you account for the first half. 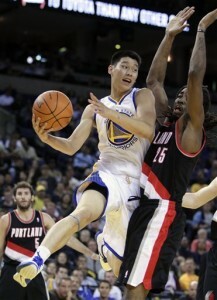 But Jeremy Lin did outshine him in the second half, and he did it in spectacular fashion. It was fascinating to see how the crowd in Cox Pavilion gradually got behind Lin. At the start of the game, he was a novelty, if not a nonentity. By the fourth quarter he was the center of attention. The gym came alive before him. When I witnessed that same electricity last Monday at Arco—an away game—I was both amused and taken in. At this point, Jeremy Lin is still somewhat of a long shot to make the rotation. Hell, he may not even make the roster. He could very well be sent to the development league. But Jeremy Lin does have athletic talent. He’s long, he’s a terrific passer, and he somehow gets to the basket. I don’t want to be the latest guy to bet against him and lose. Besides, it’s hard not to pull for him. He’s a great story in so many ways. He’s an Asian-American native son in a community that loves its basketball and is largely Asian. He is the perpetual underdog who defies his doubters every step of the way. And finally, he’s just a great, humble kid. Don’t expect much from Dan Gadzuric this season, but be glad that he is on the roster. Not only was Gadzuric part of the package that helped Riley unload Maggette to the Bucks, but he also represents seven million dollars in expiring money that should help the Warriors acquire a good player by either trade this season or free agency this summer. Aside from that Gadzuric does not bring much value to the team in terms of performance. The seven footer has averaged under five rebounds and five points per game over his career, and those stats are heavily weighted by his first three years in the league. Gadzuric is on the downside of his career, and he lacks the athleticism and skill to defend the post or do any damage on the offensive end. At last Monday night’s game at Arco, Gadzuric had an awful game, and was solely responsible for energizing Demarcus Cousins. At 6’7”, 243 pounds, Jeff Adrien is a Mac truck. Stout and brawny, but short in stature for a power forward, Adrien takes up space in the paint and holds his position. In spite of his bulk, he’s fairly nimble around the basket and has shown some deftness in the low block. Adrien was a very good college player at UConn. He was a ferocious rebounder, and he had a decent post game. His second preseason game he contributed 15 board and 11 rebounds in a 23 minutes of play. Adrien will have to have more games like that this preseason if he is to make the team. If Smart is looking for an additional wide body on the team who can offer a brute physical presence then Adrien has a chance of making the roster. Curry’s ankle lives! 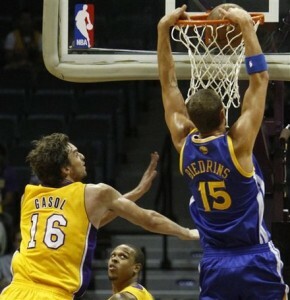 Biedrins lives! Very good (and thorough) read. No doubt they have some holes to address. but I like the foundation of this team, especially Lee and Curry. A healthy Biedrins would go a long way toward a competitive season here. I like much of what Reilly did this offseason with a few exceptions. I think their starting five will hold their own with most teams in the league. But besides Williams, their bench is very questionable. Depth was actually one of the Warriors strength in recent years. Now it looks to be their biggest weakness. I understand the need to unload cap space and acquire players like Lee, but you have to have some players who can hold their own when the starters need a breather, or worse yet, go down with an injury. My biggest criticism of all was letting C.J. Watson go. C.J. was solid, reliable and could sometimes come through with big plays to win games. The Warriors are clearly missing a backup point guard entering the season. If C.J. was still around, they would be in much better shape. Keep Radmonovic on the BENCH! Great breakdown, I think Monta Ellis is really the key for Golden State this season. If he can let Stephen Curry and David Lee mesh into the offensive flow of the game, and improve his shot selection, the Warriors will finish above .500. The small forward position is pretty suspect, not really sure what Rodney Carney and Dorrell Wright. Although he has shown some poise in the pre-season, Wright has been a disappointment so far in his career, hopefully he can keep it up as the games start to matter. Too bad Ekpe Udoh is injured, really wanted to see what he can do.